It has a great disinfectant and preservative effect. The iodine molecule it releases will kill the bacteria, oxidize active gene in bacteria cytoplasm and combine with amino of protein to change its nature, thus to kill the bacteria, fungi, virus and Amoeba. Its bactericidal activity is proportion to its concentration, and its corrosivity and irritation to body is also proportion to its concentration. It is used for disinfection of skin mucosa at operative site. 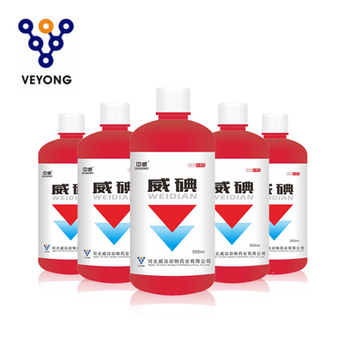 It has broad spectrum of bactericidal effect and can kill virus, bacteria, eobiont, spore etc. at a low concentration in a short time. It can be used for disinfection of environment of poultry and livestock, hatching egg, udder of milk cow, medical instrument and animal body. It has good preventative and therapeutic effect on poultry influenza, Newcastle disease, egg drop syndrome.